My March mini hops in under the wire! I hand quilted the center panel and machine quilted the rest (otherwise it would have been an April finish!). The little 1” finished squares are from my friend Cyndi (Busy Thimble). We swapped over 3,000 different 1 ½” squares a while back and I have been having a ball using them in different projects. 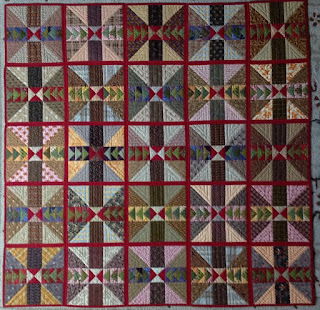 There are 288 287 different prints in this little quilt. As I was quilting it I noticed I had used the one fabric twice, can you spot it? I don’t mind having a duplicate because it is one of my favorites. 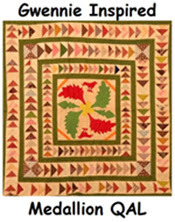 The center panel is the same Kay and Lori Lee Triplett panel I used in my basket quilt sew-a-long with Cecile (here). This one is the smallest size at 6” and the one in the center of the basket quilt was the 24” size. You can order them on their website (here). I know Kyle (Timeless Reflections) and Barbara (Quilts, Gravestones and Elusive Ancestors) have finished their March minis and I will link back to any other blogs I can find who have made a mini this month. I also had an e-mail update that the American Quilt Museum has started their auction of small quilts and other “stuff” to benefit the museum. One of mine is up for auction right now. They spelled my name wrong again, but I’m so used to it I don’t even bother to correct it anymore. My maiden (now middle) name is “Caton” not “Canton”. But I get the extra “n” a lot! Drop by the site to see all the goodies they have to offer. 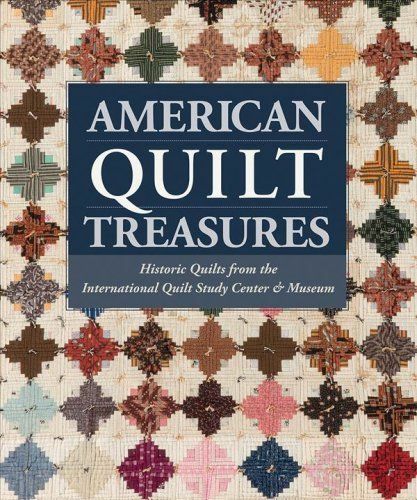 There are some wonderful quilts and baskets of quilty things! And in closing, I had a fabulous day yesterday at our quilt study group. We meet at our friend Judy's house and she generously shares her antique treasures and her incredible knowledge with us as we discuss and learn. My wish for the world would be that every person could find their personal "passion" and have friends to share in their joy. I am blessed to have so many fabulous people in my life; my "seven sewing sistahs", my quilt study friends and my blogging community friends. Life is good! I finished my Foothills sew-a-longwith Mary Elizabeth Kinch over the weekend. I love everything about this quilt. 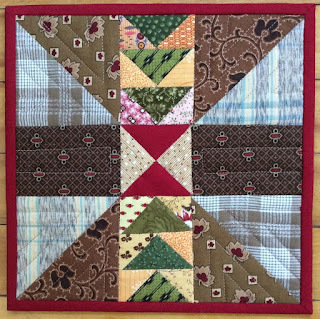 I love the pattern, the colors, the potholder method, the name I gave it, the camaraderie of doing this with other quilters and most of all I love the fact that my husband really loves it! Don’t get me wrong, he is always giving me kind and encouraging comments about my work, but when I finished this one I laid it out on the couch overnight. The next morning he said, boy I really love that quilt you finished last night. So, I was going to donate this to next year’s AQSG auction, but I might have to keep it and find another one to give away! 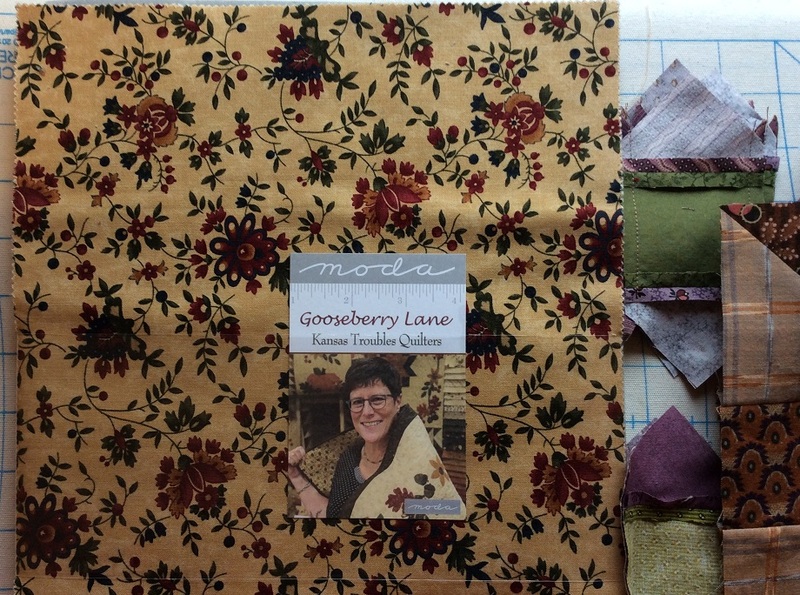 The Kansas Troubles "Gooseberry Lane" layer cake worked out perfectly for the backing squares. I was a bit nervous as I always pre-wash my fabrics, but when it was finished washed it with great care and 8 color catchers and nothing ran! Do take a minute to visit the Facebook page (here) to see all the variety. You won’t be disappointed. There are so many fabulous fabrics in different colorways. Fun! I hope you all had a fun and productive National Quilting Day on Saturday. 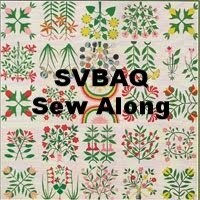 My local quilt group hosted an all day quilt-a-thon. 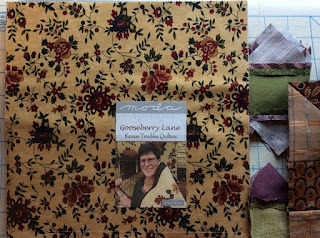 Of course I forgot my camera so I have no photos to show you other than my “Gooseberry Pie” blocks. I should be stitching them together soon! While cleaning my sewing machine, I discovered a great way to keep bobbins and spools together. Yup, the simple Q-tip! And, saving the best for last… I know I have said it before, but quilters are the best! Karen (Log Cabin Quilter) asked me if I would want a few of her orphan blocks for my next "pot luck" quilt. Look at these!!! I have enough for an entire quilt right here. And, some of these applique blocks are just too nice to be lumped into a pot luck quilt so they will have a special home. 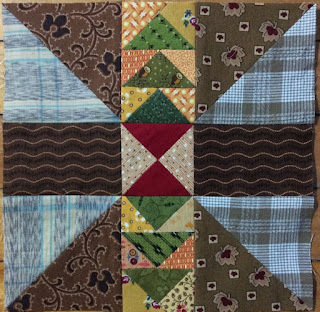 Karen's generosity started me thinking of how much fun it would be to do a Blog swap of orphan blocks. I think it would be fun to see what we all do with other quilter's "orphans. I'll have to ruminate for a while, but I would appreciate hearing how you feel about it. 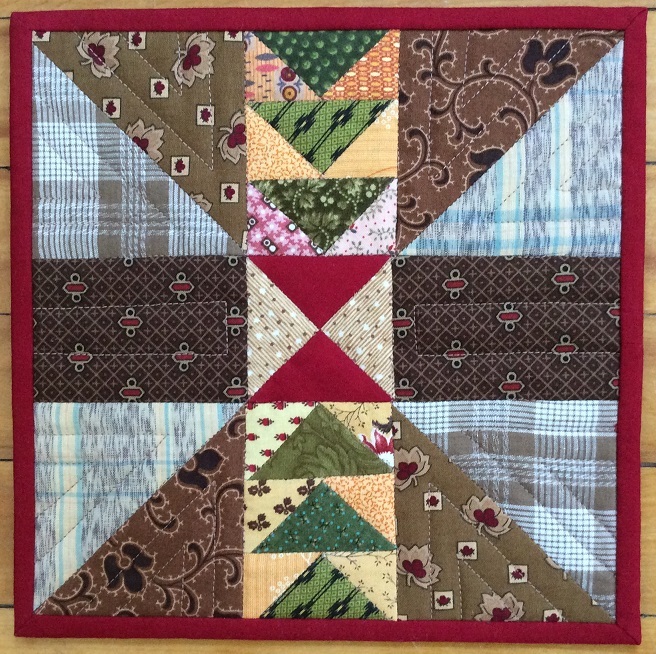 Randy's (Barrister's Block) basket quilt for Cecile's (Patchwork Inspirations) basket sew-a-long was so inspirational! That’s right, Quilty 365, the quilt I started with Audrey (Quilty Folk) back in November 2016. If you remember we were to applique one block a day for 365 days. I can’t tell you how much I missed that when the last one was done! I started hand quilting it in December of 2016. I had a great deal of the center finished before I left it sitting in a corner of the quilt annex for over a year! I decided I wanted to put it in our state show (Maine Quilts 2018) this summer, so I dug it out a few weeks ago. It looked like it wouldn’t take long to finish it, but it is funny how that perimeter is so much larger than the center!! I really love this quilt. I’ve decided to call it “Crop Circles” because it has over 700 different vintage feedsack fabrics in it. Anyway, I finished the quilting but neglected so many other things. I really missed my Noah andMatilda applique. It had been almost a month since I made my last block. I finished block 3D this morning and it felt good to be back! The backing came from a friend who gave me 3 wonderful neon fabrics that I had never seen before. I think these geese were afraid to get caught in the pie so they flew the wrong way. Anyway, I like it so I am leaving it! 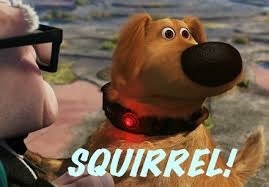 I learned about spacial relationships. 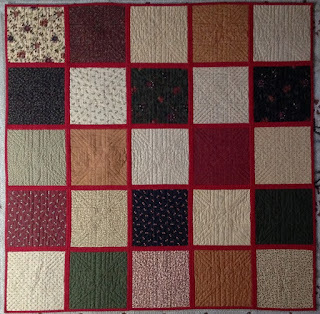 I laid out all my blocks leaving a 1/2" space of red between them so I could see what they would look like when they were all bound and stitched together (think, potholder method). I wasn't sure I liked this so I set them further apart to emulate the original wide sashing. 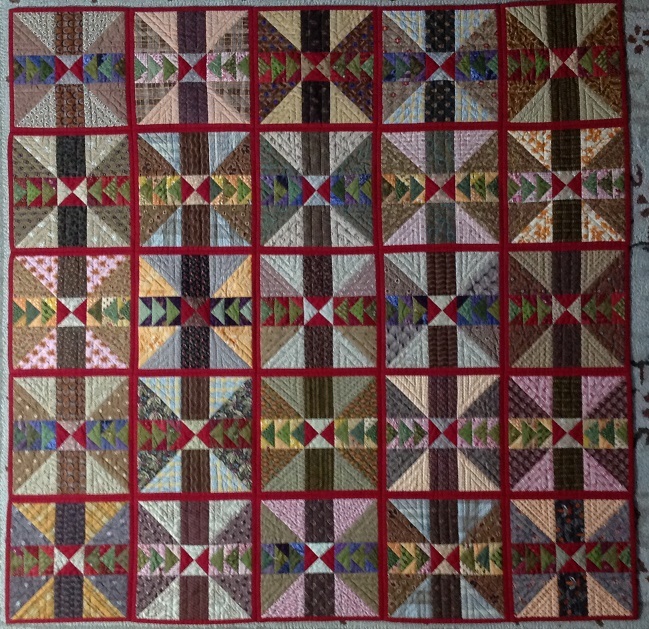 I'd have to add a 1" finished red strip around each one (before quilting and binding) to make it look more like the original. Hmm... I really like both settings, so now what? After a lot of contemplation, I decided I should really honor the original make by at least conforming to that nice wide sashing. I was just about to cut the little red strips when it dawned on me that a layer cake is 10" - my blocks finish 8 1/2" with binding so if I added an inch of width to each side (lesson #3 measure twice, cut once). So skinny red wins out. Here is the first block, quilted and bound. So, what else did I learn? I learned that I definitely like this color scheme. When surrounded by fabulous 19th century fabrics I always gravitate toward the brights. By pairing the bright and colorful reds, purples and yellows with the warm browns I really felt it had earned its name! Can you smell pie? Mary Elizabeth now has a Foothills QAL Facebook page (here). There are lots of wonderful renditions. People are really getting creative with their colors. 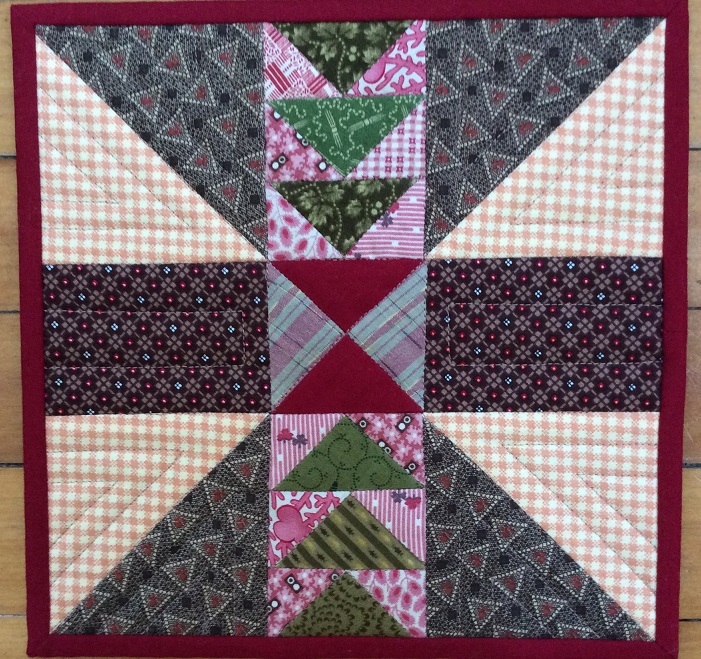 And do visit her blog (Mary Elizabeth Kinch) to see her amazing blocks. Her color scheme is sensational. I finally made a trip to Cyndi’s (Busy Thimble Quilt Shop) over the weekend. I used to go once a month, but this winter has been crazy! One thing (and there are many) I love about Cyndi is that she never asks me “what are you going to do with it?” She knows (like herself) I am a hopeless fabric hoarder collector! I promised myself when I left the driveway that I would NOT buy a book. The moment I walked in the door Cyndi handed me this treasure (a gift from her!). If you don’t have it, I highly recommend it. It has some of the best close up photos of any quilt book. Delicious! – well, let’s see, I have every other Betsy Chutchian book and I really didn’t want my other new book to be lonely in the car so…. I caved. I love every quilt in here. 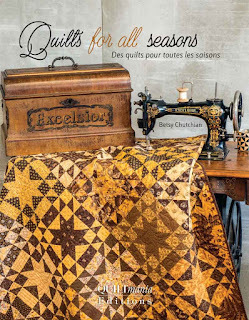 It is not inexpensive as it is published by Quiltmania, but it was well worth it to me (especially since it will be the last book I buy this year – wink!). I suggest you grab a cup of your favorite beverage and scroll through Cyndi’s blog (Busy Thimble). What a treat! Baskets with Cecile - Finis! I had fun making these little “Cake Stand” - basket blocks in Cecile (Patchwork Inspirations) sew-a-long. It's hard to believe I actually finished on time! 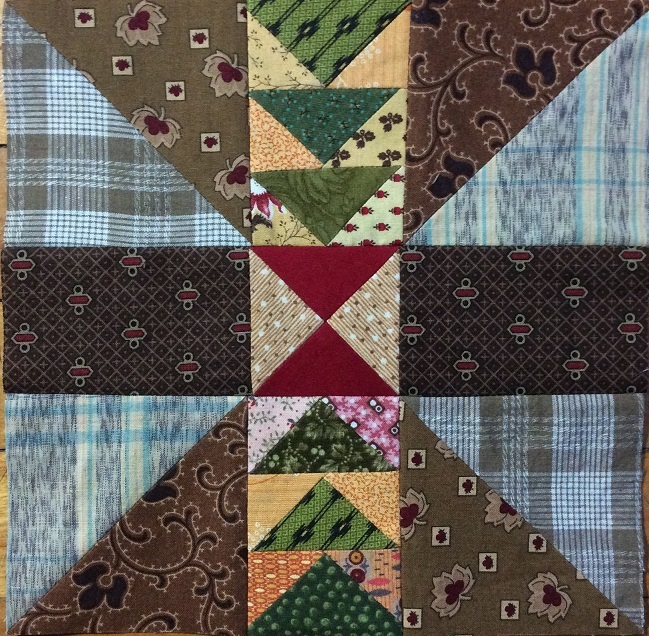 The center is cut from Kayand Lori Lee Triplett’s fabulous fruit basket panel. They printed these in 3 sizes and I bought all three! To order one (or two or three) for yourself visit (here). This one is the 25" size. I experimented with a few layouts, but decided in the end to simply broderie perse the edge units around the hand appliqued center. I hand quilted the center and machine quilted around the little cake stands. I used one of my favorite Di Ford fabrics on the back. I’m calling this one “Fruitcake”. Thanks Cecile for a really fun sew-a-long. You can see all the wonderful variations on the Facebook page (here).